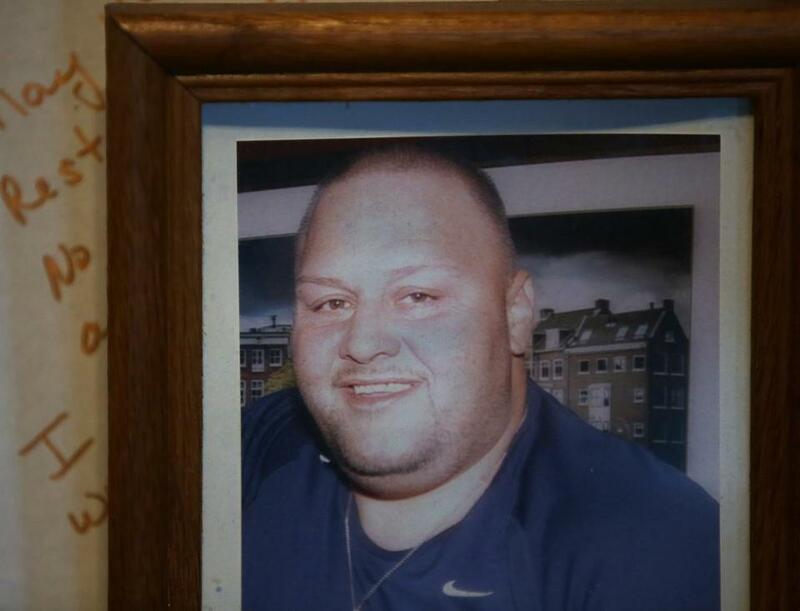 Kenneth "Bubba" Levesque died of a Fentanyl overdose two days after he was discharged from Braemoor Health Center. State investigators found that the home failed to provide him with substance abuse counseling. Kenneth “Bubba” Levesque was taking medicine to quell his cravings for heroin when he entered Braemoor Health Center last summer. Massive infections had forced the amputation of his lower left leg, and he needed help learning how to walk again with a prosthetic limb. Levesque, a teddy bear of a man, seesawed between addiction and recovery many times over the years, and told his family that this was his wake-up call, that he was finally going to “get clean” while in the Brockton nursing home. But state records show that three days after Levesque was discharged from Braemoor in March, the 43-year-old was dead from an opioid overdose, a grim coda to his seven months at the nursing home. During those months, according to state reports and Levesque’s family, he received escalating doses of opioid medications and no substance abuse counseling — at the very time he had vowed to banish narcotics from his life. Even as regulators and health leaders have launched myriad initiatives to combat the opioid crisis in Massachusetts, nursing homes — where potent pain medications are routinely administered — remain distant outposts. Few nursing homes are prepared to identify and treat residents with a history of substance abuse, and even when they do, services to care for such patients have typically not been a priority, say addiction and long-term care specialists. The issue became news this summer when Braemoor became one of at least two Massachusetts nursing homes where state inspectors declared patients in “immediate jeopardy” because of serious violations, including lack of substance abuse treatment and staff training. care — says it has since significantly improved treatment for residents with addictions. The critical gap in substance abuse care is expected to grow as baby boomers reach an age when they begin entering nursing homes at a hastening rate, specialists said. “The addiction crisis is going to be in patients in every demographic, and it behooves nursing homes to learn how to take care of [these] patients,” said Dr. Sarah Wakeman, medical director of the substance use disorder initiative at Massachusetts General Hospital. Physicians need to be more aware of drug addiction in nursing homes, according to Dr. James Gessner, president of the Massachusetts Medical Society. But that may be about to change. Gessner said the society’s panels on opioid therapy and on geriatric care will soon discuss ways to help physicians better address the issue. “This is not age-dependent, not social- or economic-background dependent, and it certainly has to be an issue when taking care of our elderly patients, especially with the many mediations our elderly patients are on,” Gessner said. A June report from the federal Office of Inspector General found that millions of older Americans received prescriptions for commonly abused opioids last year through Medicare, the government insurance program for people over 65. Nearly one-third of beneficiaries getting prescriptions through Medicare received at least one of these drugs. And on average, these patients each had five opioid prescriptions in 2015, the report concluded. Nursing home leaders say they are asking state health regulators for guidance on how best to care for the rapidly growing number of patients coming through their doors with drug addictions. Tara Gregorio, senior vice president at Massachusetts Senior Care Association, the industry trade group, said administrators worry about visitors slipping nursing home patients opioids and other drugs. The guidance arrives too late for Levesque’s family, who say they were repeatedly rebuffed when they asked nurses at Braemoor Health Center about the powerful narcotics Levesque was receiving. “I got into an argument with the lady who discharged him because they were sending him onto the street with nothing. No [addiction] counseling, nothing,” his sister, Robin Levesque, said. Braemore’s parent company declined to answer questions about Levesque’s care. The other nursing home recently penalized for lacking substance abuse treatment was Parsons Hill Rehabilitation & Health Care Center in Worcester. A patient there overdosed on heroin after injecting the drug directly into a tube that nurses had inserted so an ankle infection could be treated with intravenous antibiotics. A state investigation did not detail how the patient obtained heroin while at the nursing home but found he wanted help with a substance abuse problem and had not received it. The investigators concluded that Parsons Hill failed to develop substance abuse care plans for that patient and eight others who struggled with addictions, including one who also admitted using heroin while at Parsons Hill. In the wake of the Braemoor and Parsons Hill cases, the state Health Department in May trained its nursing home inspectors about abuse of drugs in nursing homes to help them recognize whether facilities are providing appropriate care to patients with addictions, according to the department. Synergy Health Centers, the New Jersey company that owns Braemoor and 10 other Massachusetts nursing homes, said in a statement the company instituted procedures to identify and treat substance abuse problems at all its nursing homes. Those measures include identifying residents at risk of addiction and referring those with a history of substance abuse to treatment. The company also is educating staff about chronic pain, opioid use, and addiction. Additionally, it is conducting weekly support meetings for residents run by specialists. Finally, Synergy said it enhanced surveillance in outdoor smoking areas. The statement did not say whether Athena Health Care Systems, the Connecticut company that manages Parsons Hill, has enhanced substance abuse care at its 18 other Massachusetts nursing homes, or those it manages in Connecticut and Rhode Island. Athena declined to answer further questions. For patients who have already started down the path to substance abuse treatment, finding a spot in a nursing home can prove vexing. Mass. General’s Wakeman said nursing homes sometimes misunderstand federal regulations regarding treatment of patients receiving medicine to block opioid cravings. That prompts the nursing homes to claim — erroneously — they cannot accept such patients, forcing Wakeman to regularly hunt for nursing homes for patients who need longer-term care, but who also are receiving treatment for substance abuse. A New York nonprofit, The New Jewish Home, is trying to make it easier for addicts to find care in nursing homes. Two years ago, it embarked on an experiment involving 120 patients that included Alcoholics Anonymous meetings in the nursing home, talk therapy, and care by specialists who replaced potentially addictive drugs with medications that don’t lead to addiction. Program workers paid close attention to patients as they were discharged, to ensure they had ample support, including outpatient therapy and home visits. Executives for the New Jewish Home said they have not yet calculated how much the intensive program costs for each patient, but have committed to continuing it. In the first two years, the company found that roughly two-thirds of patients who had been addicted to alcohol or drugs reported no relapse one month after discharge. “If that home visit indicated a relapse, I would do a second home visit with them, to make sure they are getting whatever services they need,” said Sherry Samaroo, coordinator of the geriatric substance abuse recovery program for the nonprofit. Kay Lazar can be reached at kay.lazar@globe.com.